Photo Archive This is a sample of historical photographs. Links below lead to photo collections, videos, primary source documents, digitized newspaper articles, links to related materials, and more. Maritime work is as old as the first boats that put to sea. Maritime work includes all the work performed onboard seafaring vessels; any worker on a ship - seamen, boatswains, deck hands, officers, engineers, pilots, cooks, firemen, mates, service staff and stewards - are maritime workers. On the Pacific Coast, maritime workers have a long history of struggling to improve their conditions of labor and have built many unions to that end. Typically the industry has been organized by craft, although there have been attempts to unite all maritime workers in large industrial organizations. 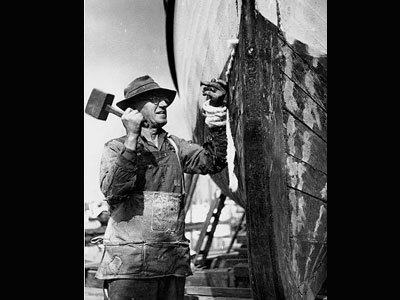 This page provides an overview of maritime labor, as well as photos, documents, and individual pages on the history of major craft organizations. At the core of the maritime tradition is the work of sailors and seamen. In the nineteenth century sailors were treated abysmally, enduring dangerous working conditions and minimal living conditions while at sea, and often scammed, hustled and taken advantage of on shore. The regime of the ship was unlike any other form of private employment. Captains ruled with an iron hand, and until 1890s had the power to order corporal punishment. 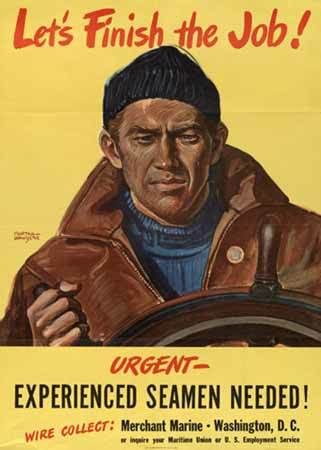 Seamen only gained full legal rights with the passage of the Seamen’s Act in 1915, and the ability to legally unionize with the New Deal reforms of the 1930s. Marine Cooks and Stewards The history of the National Union of the Marine Cooks and Stewards was one of segregation and racism until black and Asian workers forced their way into the union in the 1930s. 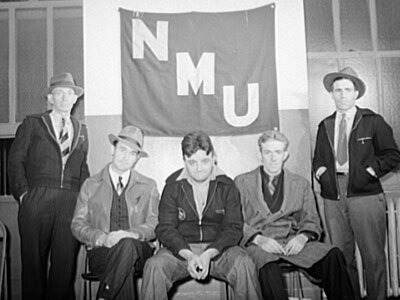 NUMCS then became a leading civil rights and social justice maritime union. 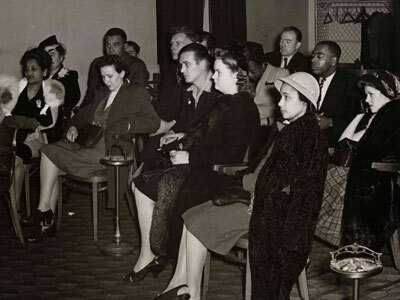 Here you will discover photos, documents, personal histories, library finding aids, and original essays on the history of desegregating the union. Sailors Union of the Pacific The sailors union is one of the oldest unions of any type still in existence. Founded in 1896 the SUP won major improvements in the working lives of sailors in the 20th Century and now in the 21st survives in an era of global free trade and hostility to union representation. Here you will find library finding aids, links and personal histories. Marine Engineers The Marine Engineers Beneficial Association is the union of the engine room workers. Here you will find MEBA related materials, links and library finding aids. In the early 1880’s, sailors outraged at their intolerable working conditions formed organizations that would become the Sailors Union of the Pacific (SUP), founded in 1886 from a dramatic strike over wages, working conditions and union representation. 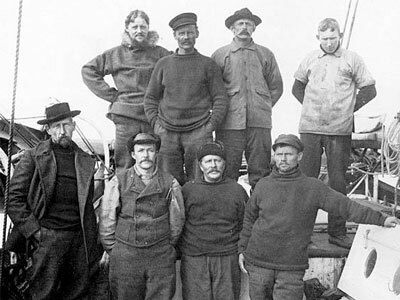 Other seafaring workers were simultaneously forming organizations of their own. 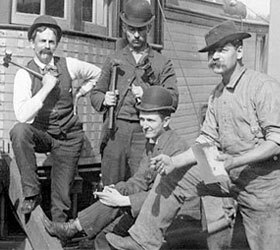 The Marine Firemen, Oilers and Watertenders Union (MFOW), which brought together engine room grunts and firemen, was also formed in the 1880s. Other maritime unions like the Marine Engineer’s Beneficial Association (MEBA), the Inlandboatmen’s Union (IBU), the union of Masters, Mates and Pilots, and others were all born in this period. 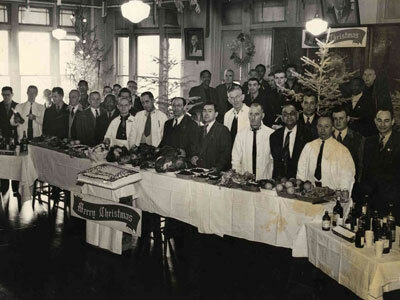 In 1901 the cooks and service staff came together in the Marine Cooks and Stewards Association of the Pacific (MSC). Meanwhile, the Sailors Union of the Pacific, had joined with similar organizations representing mariners from the Great Lakes, Gulf Coast, and Atlantic ports to form the International Seaman’s Union (ISU), an AFL affiliated umbrella organization. In the sailor’s union the SUP leadership, in particular that of president Andrew Furuseth, inclined toward straight craft bread and butter unionism. Furuseth also headed up the International Seamen’s Union which was instrumental in passing the 1915 Seamen’s Act. The law ended the authoritarian order on ocean going vessels and gave seamen important legal rights, in particular the right to disobey a work order and not be charged with criminal mutiny. The 1915 Act built on legal gains from the late 1890s that ended corporal punishment for seamen. 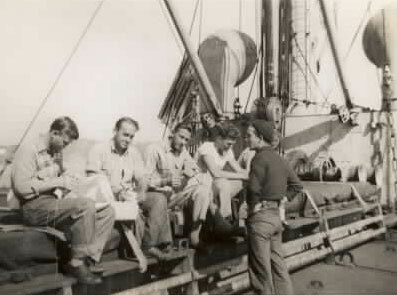 At the same time that union leadership was turning toward craft unionism, mariners were adopting a militant type of rank and file organizing. Syndicalism, a tradition of labor militancy that eschews electoral politics in favor of direct action and large, industrial unions over narrow craft organization, played a major role in this period of maritime history. Syndicalist unions like the Industrial Workers of the World left an indelible mark on the character and consciousness of working sailors at the beginning of the twentieth century. The organizing slogan of the IWW (or the Wobblies, as they were known) of “One Big Union” best summarized the militant syndicalism of rank and file seamen. This early period of legal and organizational victories reached a high point at the end of World War I, when the tide quickly turned against the working mariners and their unions. Two strikes, one in 1919 and another in 1921, marked this quick turn around. In the 1919 strike sailors refused work in order to win concessions on wages and working conditions. As the industry was experiencing a boom from war-time shipping, the workforce wanted higher wages and more respect on the job; and they were largely successful. The 1921 strike on the other hand was a devastating blow to the Sailor’s Union. The impetus for the strike was an employer offensive against the gains by workers of the previous several years. The sailors were divided. Employers fostered racist attitudes and then hired black and minority workers as strike breakers – the same workers that had been excluded from the all-white unions. After a two month strike workers saw their wages reduced by 25 percent, and the rest of the decade and into the 1930s marked a low point for maritime unions. 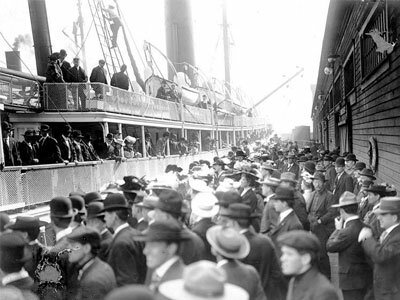 The 1921 strike further exacerbated longstanding racial divisions within the maritime trades. Craft unions had long excluded workers of color (in contrast to the open IWW). Moreover, Black and Asian workers were usually limited to cooking and food service on board ships. 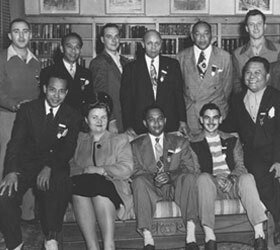 And even the union representing those trades, the Marine Cooks and Stewards Association of the Pacific, had a whites-only clause in its constitution. 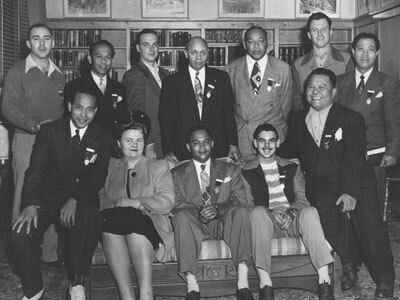 In response, Black workers organized their own union, the Colored Marine Employees Benevolent Association which finally merged with MCS during the 1934 strike. The 1921 loss was also made worse by the post-war Red Scare. Radicals of all stripes were targeted, especially those aligned with the IWW. The Justice Department and local police agencies arrested, deported, harassed and intimidated militant union organizers, as fear of Bolshevism, anarchism, and socialism swept the nation. The effect on maritime workers’ ability to defend their interests was devastating. It wasn’t until the 1930s that mariners were able to recover from the government repression of the 20’s. The pivotal moment came in the 1934 West Coast maritime strike where sailors played a significant role in the victory, honoring the longshoremen’s picket lines and supporting the San Francisco general strike. This brought a revival of maritime unions in general, including the sailor’s SUP, as victories on the picket line against employers, and the federal government’s apparent willingness to defend authentic unionization, boosted the number of unionized workers. As mariners won gains through mutual support, militants attempted to build on these moments of political unity, and over the next decade made several attempts to affiliate in industrial organizations. The Maritime Federation of the Pacific was one such attempt. 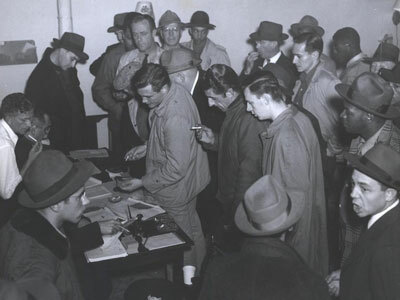 Favored by Harry Bridges and the longshore union, the Federation provided crucial support for a 1936 seamen’s strike, a strike that won the sailors many of the benefits the longshoremen had won in ’34. The ’36 strike marked a high water mark of political and union militancy between the sailors and the longshoremen. Other maritime unions were also making a comeback, partly as a result of the rank and file organizing by communists. 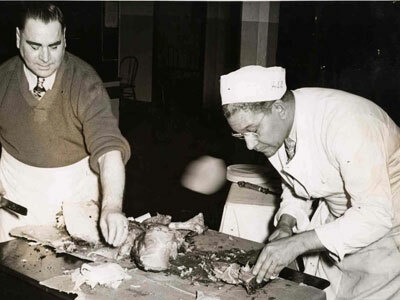 The union of the Marine Cooks and Stewards was particularly influenced by reds, not only because of their emphasis of rank and file militancy, but because the communists also had a dedicated policy of anti-racism and would defend black workers targeted by employers and co-workers. Despite the gains, continued political, personal and ideological differences hurt the cause of industrial unity. Longshore workers, with a strong democratic tradition and communist influence were working closely with the industrial minded CIO, while the more traditional sailors allied with the AFL. The longshore union (ILWU) led by Harry Bridges and the SUP headed by Harry Lundeburg became arch rivals. 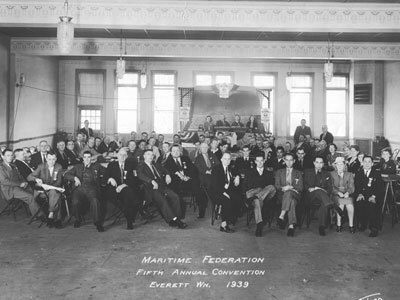 Following this general divide, two rival maritime federations, the National Maritime Union (allied with the CIO) and the Seafarers International Union (connected to the AFL), were formed and competed for members and contracts. The next decades saw the two factions, Lundeburg and the seafarers and Bridges and the longshore workers, engaged in periodic raids and organizing drives against opposing unions. By this time the hope of creating a successful industrial federations had faded. Racism, anti-communism and other political differences kept maritime unions apart. Yet the period of postwar American prosperity meant that unions were often successful in fighting for bread and butter issues. Employers learned to respect the unions. The postwar decades saw major improvements in standards of living and working conditions for maritime workers. In recent decades the Seafarers International Union, the organization that succeeded the International Sailors Union in the 1930s, has succeeded in unifying more of the industry. The SIU benefited from a series of mergers in 1970s with the Firemen, Oilers and Watertenders, and the Marine Cooks and Stewards. In 2001, the longtime rival National Maritime Union, which had formed under the CIO, finally agreed to merge with the SIU. At present the SIU has approximately 20,000 members and a dozen affiliate unions. However, conflicts with employers and changes to the industry have continued to harm organizing efforts. Shipping companies have sought to avoid employing union labor and shifted their fleets to “run-a-way” ports; in a maritime version of outsourcing they register their ships in nations without high labor standards, taxes, or records of enforcement. Furthermore, modern shipping vessels and containerized shipping require minimal crews, reducing the workforce, and the strength and resources of maritime workers’ unions. Despite these set backs, maritime workers and their unions continue to fight for the interests of their members and of the working class more broadly. The ILWU and the Sailor’s Union of the Pacific have a closer relationship than ever before, and have even supported one another’s pickets. At the beginning of the 21st century, maritime workers face serious challenges, but also a more propitious environment for unity then previous generations have known.